Low unemployment and demand exceeding supply of certain professions mean that employers compete in introducing wide portfolios of newly structured benefits in the hope of obtaining the necessary reinforcements for their teams. Traditional benefits are experiencing a renaissance in many companies, helping retain existing employees and strengthen their loyalty. Employee bonuses for work anniversaries and major birthdays are starting to reappear and employers newly offer bonuses to mark the occasion of marriage, birth of a child etc. And questions resurface regarding the correct way to account for these traditional benefits. Benefits mean compensation in addition to the salary that is regulated either in a collective agreement where a trade union organisation exists, or in an internal policy or the employment or other (e.g. management) contract. The provision of benefits is regulated especially by the Labour Code and their taxation by the Income Taxes Act. The Labour Code stipulates that the employer can give the employee a bonus especially upon a major birthday or a work anniversary, the end of employment after the granting of third-degree disability pension or after becoming entitled to old-age pension, for the provision of help in the prevention of fire or during natural disasters, their elimination or removal of their consequences or during other extraordinary events where life, health or property may be in danger.1) These bonuses are discretionary, the employer is not required to give them to employees. The Income Taxes Act stipulates that the costs of the payment of bonuses for work and life jubilees, if the employees’ right to their provision arises from the collective agreement, internal policy of the employer or the employment or other contract, can be included in tax deductible expenses of the employer.2) Bonuses provided for work and life jubilees regulated by the collective agreement, internal policy or the employment or other contract and provided in monetary or non-monetary form represent taxable income of the part of the employee and insurance payments are levied on them, unless they are provided on occasions listed in Section 14 of Regulation No. 114/2002 Coll., on the Fund for Cultural and Social Needs (“FCSN”), or unless they are provided in non-monetary form as specified in Section 6 (9) d) of the Income Taxes Act. However, the exemption on the part of the employee is possible under the condition that the expenses on the part of the employer are not tax deductible, or that they are provided from the social fund or profit after tax. Employers may give gifts to employees only from the FCSN, and employers that are not subject to the FCSN regulations may give gifts from the social fund, from profit after tax or as a charge to non-tax expenses. 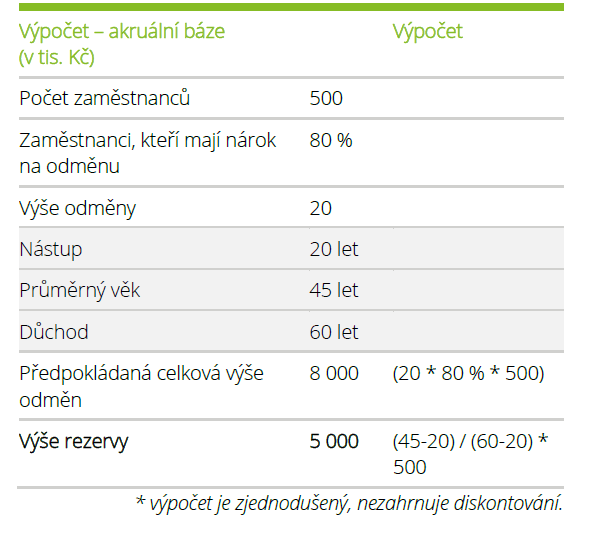 For employees, only non-monetary performance provided free of charge (gift) from the FCSN, from the social fund, from profit after tax or as a charge to non-tax expenses can be exempt from the income tax, in the aggregate amount of up to CZK 2,000 per year provided for: extraordinary activity to the benefit of the employer, for social or humanitarian help, on the 50th birthday and then every five years, on the 20th work anniversary and then every five years and on the first retirement with old-age pension or third degree disability pension. Non-monetary gifts (listed in Section 14 of Regulation No. 114/2002 Coll., on the FCSN) exceeding the annual aggregate limit of CZK 2,000 for the employee, non-monetary gifts provided outside of the scope of this regulation (i.e. on other occasions) and all monetary gifts, regardless of the purpose for which they have been provided, represent taxable income of the employee. Non-monetary performance free of charge (gifts) exempt from income tax is not included in the assessment base for the payment of insurance premiums and insurance premiums are not levied on them. Non-monetary and monetary performance free of charge (gifts) that is not exempt from income tax is included in full in the assessment base for the payment of insurance premiums and insurance premiums are levied on them. For example, if the employer provides an employee with a motivational bonus on the 10th work anniversary at the company, the gift will not be exempt from tax, since the respective FCSN Regulation mentions only gifts on the occasion of work anniversaries of at least 20 years of employment by the employer. During our discussions with clients we often come across questions of how to correctly account for bonuses arranged in collective agreements or other documents binding for the employer. Many companies account for these anniversary benefits when they are paid out to the employee. Is this treatment correct, or are thoughts of recognition of a reserve for existing payables of the employer floating around? The Accounting Act 3) assumes that the entity uses double-entry bookkeeping to account for the balance and movements of property and other assets, payables including debts and other liabilities, as well as expenses and income and profit or loss in the period to which these facts relate on the accrual basis of accounting, and all expenses and income are recognised regardless of the moment of their payment or receipt. This definition means that the origination of a payable should be recorded in accounting books. Valuation at the end of the balance sheet date should include only profits that have been achieved as of the balance sheet date, and take into account all the foreseeable risks and possible losses concerning assets and payables known to the reporting entity by the time of preparation of the financial statements, as well as all impairment regardless of whether the result of the reporting period is profit or loss (principle of prudence). This provision is reflected in reserves, provisions and depreciation of assets. Reserves are intended to cover payables or expenses whose nature is clearly defined and that are, as of the balance sheet date, likely or certain to arise, but uncertain as to their amount or timing. As of the balance sheet date, the reserve has to represent the best estimate of the expenses that are likely to arise, or in the case of payables the amount necessary for settlement 4). If the entity recognises a reserve in relation to the prudence principle, it is charged to expenses. Reserves are decreased, released or used based on inventorying. In such a case they are credited to expenses. Reserve balances are carried forward to the next reporting period. The reserve should represent the best estimate of the payable to employees who will become entitled to the bonus in the near future or later and the bonus will be paid out to them when they reach the respective jubilee. The amount of this payable depends on the specific conditions of the contract and on the internal situation of the entity as such. The calculation of the reserve should take into account in particular the size of the target bonus, the potential number of employees who will stay with the employer until the jubilee date etc. The estimation of the payable for the payment of bonuses is rather complicated and the services of an actuary are usually used for the calculation. The actuary uses actuarial methods, demographical data, statistical information (e.g. salary growth rate, development of the discounted interest rate), data of the specific reporting entity (e.g. average duration of employment) etc. and calculates the amount of the payable, i.e. the amount of future expenses (discounted cash flows) arising from the payable that should be reported in the form of a reserve. The reserve is measured at fair value, analogically to technical reserves. The method of calculation and valuation of the reserve is not clear at first sight from the Accounting Act or from the Regulation, and many entities therefore forget about them and do not account for the reserve for bonuses on major birthdays, work anniversaries, retirement etc. Instead they account only for the actually incurred expenses during the reporting period with respect to the person to whom the benefits have been paid out. These reporting entities use cash accounting (i.e. at the time when the cash outflow occurs) and not accrual accounting (at the time when the payable originates). In principle, we believe that payables agreed in collective or similar agreements create the obligation to recognise a reserve if there is an existing payable, in line with the accrual principle and the prudence principle. Traditional companies that have been active on the market for a long time often have a relatively stable employee base, especially in the regions, composed of local inhabitants. For such companies, the payable arising from the collective agreement could be significant and its omission from the financial statements would lead to their misstatement. However, even new start-ups that are trying to stabilise and retain their experts through the awarding of jubilee benefits will have to calculate this reserve in order to determine the materiality of this item and its reporting. In certain cases, a reporting entity may report the jubilee benefit on the cash basis of accounting without being in conflict with accounting regulations and the prudence principle or the accrual principle. This will be the case especially if the payable in the collective or similar agreement can be cancelled or significantly reduced by the management or if there are additional conditions for the payment (e.g. achieving a particular level of profit), high employee fluctuation where essentially only few people will be entitled to the benefits in the future, and last but not least, a disproportion between the costs of obtaining the information and the profit of such information. In any case, the entity should perform a calculation of the existing payable arising from the collective or similar agreement in order to discover the materiality of this item. If the amount identified is not material, it is naturally not necessary to report it in the financial statements. A company has concluded a collective agreement in which it has committed to paying a bonus of CZK 20,000 upon retirement to employees who have worked at the company for at least 20 years. The company is stable, the number of employees does not change significantly. Employees retire at the age of 60, the average age of an employee is 45, employees start employment on average at the age of 20. The analysis shows that 80% of employees stay with the company until retirement. During the current period, two employees reached the personal jubilee and the bonus was paid out to them in the same period. The comparison of the two options shows a clear difference in the impact of the recognised reserve on the profit of the current year as well as on the amount of reported payables. While with cash accounting, the result is a loss of CZK 40 thousand, with accrual accounting the result in the year of creation of the reserve is a loss of CZK 4,960 thousand. The recognition of the reserve essentially “blocks” a part of the profit from distribution and saves it for the period when the actual payments of bonuses for work and life jubilees take place. Cash accounting may lead to the generated profit being prematurely distributed among the owners and in an extreme case, there would not be enough left to settle the company’s payable to employees arising from the bonuses for work and life jubilees. The company or its part may be subject to sale or transformation. If existing payables are accounted for only on a cash basis, due diligence will probably show the existence of a payable arising from bonuses for work and life jubilees. A potential investor may be unpleasantly surprised to discover the existence of the unreported payable. In our case, a payable of CZK 4,960 thousand would be missing in case of cash accounting, which would significantly misstate the financial position. In addition, the investor could reconsider the investment plan, and not just because of the amount of the payable but also because of decreased trust in the presented financial statements. Recognition of employee benefits does not have to be a trivial accounting entry. We will not make a mistake if we carefully review collective agreements, internal regulations concerning employee benefits, management and other contracts during year-end inventorying at the latest, and check the correctness of their reporting in the company’s financial statements. If we report an existing payable arising from bonuses for work and life jubilees on an accrual basis, our CFO can certainly rest easy. Reporting on a cash basis does not have to mean a mistake either, but such an approach has to be supported by valid arguments and it should be verified every year during the preparation of the financial statements that the arguments still apply and can be used in the next reporting period.